Just because you are stuck at the office doesn’t mean you can’t fit in an effective workout. Of course this is my philosophy of something is always better than nothing. ALWAYS! Park the car farther away, jump off the bus a block ahead, get out of the cab a half mile up the road. Did you know that just a 10 minute walk can burn over 50 calories? If you did this to and from work you could lose 10 pounds this year. For more walking ideas check out this list on all the lose weight walking ideas there are. 2. Don’t be tied to your desk. If you get stuck on conference calls, whether its the phone or Skype, just put them on mobile and start walking or going up and down the stairs. If you need to take notes then take a clipboard. You can also ‘pretend’ to work while you are fitting in exercise by popping in your ear-buds and taking your phone on a walk. If the boss see’s you just start talking as if you have someone on the other end. If you have small groups of people who meet on a regular basis to discuss the budget, or sales, or whatever. Hold the meeting on the run and as each person has their turn to make group suggestions or presentations, have them move quickly up to the front. 4. Give the elevator its walking papers. Regardless what floor you work on you can still take the stairs. Get off five floors below and walk up to your office. If you are worried about sweating – wear a light t-shirt under your work shirt that you can remove after you get to the office, or keep fresh clothing in your locker. 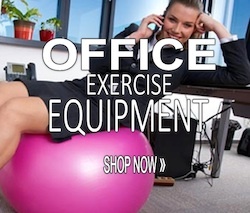 Have you checked out all the exercise equipment that you can use at your desk? There are more and more pieces of office exercise equipment being produced all the time and its a great way to keep working at your desk and still get the blood pumping during your work day. Don’t send a email if you can deliver the news in person. Or double up – send the email and get up and walk to the person’s desk to let them know you sent one. Stand up ans stretch your arms overhead, touch your toes, twist and stretch. Breathe deeply, do knee bends, leg lifts, desk pushups etc. There are a tonne of 30 second exercises and stretching routines you can do several times a day. All this will add up into a fitter body and calories burned. Pick a fitness center close to work or close to home and on the way to work each day, stop in with your gym bag and lock it in the locker. The trick is to lock your house keys in your gym bag. This way you HAVE to stop on the way home to get your house keys. Since you are there (and getting to the gym is 90% of the equation) you may as well workout too. 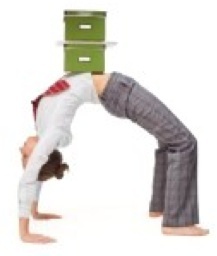 Take charge and organize a weight loss challenge or a office fitness challenge for all the people in the office. 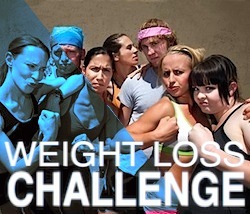 Fitness doesn’t just mean lose weight and there are several challenge ideas that you can do. Make it a weekly thing for each team to come up with a challenge and fitness goal. This way you can make it part of your work environment.